Do you want to accurately determine the state of your health? 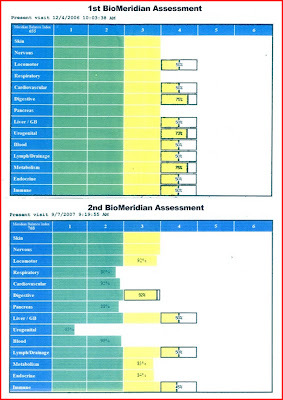 BioMeridian testing non-invasively assesses the energy meridians (channels) of the body and determine functionality of organs and tissues of your body accurately. This revolutionary profiling tool provides objective data which assists in determining what major systems and organs of the body are stressed or weakened, what homotoxicological phases are potentially in process, and what symptoms may be present within the identified phase. The technology found in the BioMeridian combine the work of two incredible doctors. Dr. Reckeweg, spent his life documenting the 6 phases of 600 different conditions and their progression. The other, Dr. Reinhold Voll, documented the acupressure points, that when measured, accurately show the functions of the tissues and organs associated with that point. This research, combined with the advanced technology found in the system itself, provides the client with an easy to understand graph showing their state of overall health and the best nutritional choices available from whole food supplements or herbs. Results of the changes can be monitored as often as necessary. Who can benefit from this type of testing? This test would benefit anyone interested in examining and improving the functional energetic status of their own bodies. This applies to those who are unwell and looking to improve their health as well as those who have no diagnosable illness but would like to optimize their current state of health and possibly prevent future negative health issues. 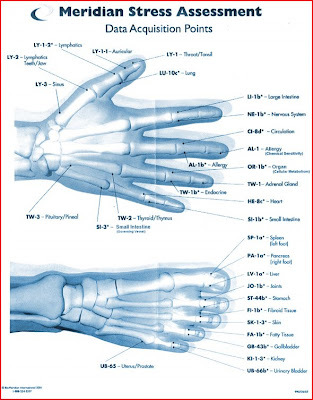 The examination is performed by testing the main acupoints on both hands and feet which relate back to the energy channels and their related organs, systems, or functions. This testing does not involve needles, only a stylus is used to send a very small electrical current (not a shock) through each point, which is recorded and analyzed by the computer system. Be prepared to sit for up to an hour during this detailed examination, so wear comfortable clothing and relax.